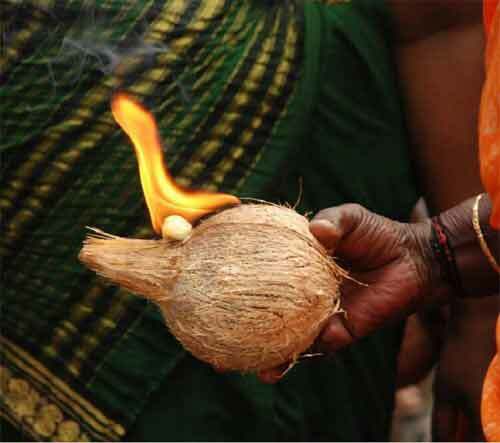 Coconut is an important offering in Goddess Shakti temples in North India. Unbroken coconut is offered in temples like Jwalamukhi and other important shrines. Symbolically offering coconut is equal to offering one’s own head. Legend has it that once there was an ardent devotee of Mother Goddess Shakti named Dhyanu Bhagat. He worshipped Mother Goddess Shakti in the Jwalamukhi form. He used to take pilgrims to the Jwalaji Temple in Himachal Pradesh. Dhyanu Bhagat lived during the period of Mughal emperor Akbar. Akbar who came to know about Dhyanu Bhagat's devotion summoned him to his court and enquired about nature of Goddess Jwalamukhi. Dhyanu Bhagat told him that She is the Mother of the universe and answers the prayers of Her devotees. To test the power of Goddess Jwalaji, Akbar cut the head of Dhyanu’s horse and asked him to have it put it back with blessings of Goddess. Dhyanu went to Jwalamukhi Temple and prayed a day and night. Goddess did not appear. Then Dhyanu cut of his own head and offered it to the Goddess. Suddenly, Goddess Jwalamukhi appeared riding a lion and restored the head of Dhyanu and horse. Moved by Dhyanu's devotion, Mata gave him the boon that in future people should only offer coconut to her. It will be accepted as offering one’s own head.